Get a load of Alien 5’s new pulse rifle! Kathleen Kennedy says it’s inevitable a woman will direct a Star Wars film. Hansel and Gretel: Witch Hunters will return... on TV. Plus, Agents of SHIELD casts a mysterious new character, and new clips from tomorrow’s Doctor Who. Spoilers! It is going to happen. We are going to hire a woman who’s going to direct a Star Wars movie. I have no doubt. On the other hand, I want to make sure we put someone in that position who’s set up for success. It’s not just a token job to look out and try to find a woman that we could put into a position of directing Star Wars… If we do want to bring a woman in to direct a Star Wars movie, we want to make sure that it’s somebody who’s passionate and really, really wants to do a Star Wars movie. We don’t want to talk somebody into it. Here’s a new sizzle reel for the film. 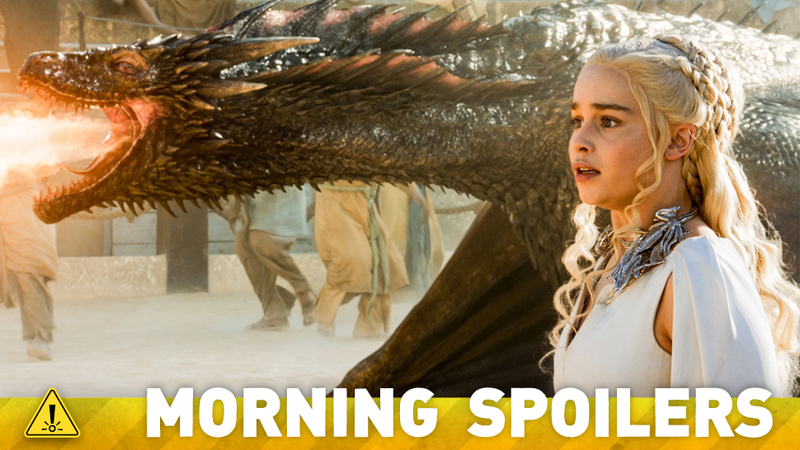 Meanwhile set reports from the same filming from Spanish fansite Los Siete Reinos has a few details of the scene being filmed, which sees Drogon burn a Dothraki temple to cinders—and that Daenerys allegedly walks out of the burning wreckage unharmed, gaining the instant adoration of not just the Khalasar that found her, but multiple Khalasars. Butch leads Penguin and his men to the warehouse where Gertrude is being held, as Penguin plots his revenge on Galavan for kidnapping his mother. Meanwhile, Nygma deals with the aftermath of a deadly accident in the all new “Rise of the Villains: Mommy’s Little Monster” episode of GOTHAM. When Pandora unleashes an iconic monster to haunt the residents of Sleepy Hollow as they sleep, Abbie and Jenny are tempted to confront a painful part of their past. Meanwhile, Abbie makes a crucial decision for her career and Crane does his best to guide her with wisdom from his own experiences. Will Ichabod lead Abbie to the right decision? “Stronger Together” – When Kara’s attempts to help National City don’t go according to plan, she must put aside the doubts that she – and the city’s media – has about her abilities in order to capture an escapee from the Kryptonian prison, Fort Rozz. Also, Cat pressures James to use his connection to Superman to get her an interview with Supergirl. Additional reporting by Gordon Jackson and Charlie Jane Anders. Image: Game of Thrones.